Academics like to believe they are engaged in the pursuit of Truth. Seth Lerer's learned, brilliant and often witty book, Error and the Academic Self: The Scholarly Imagination, Medieval to Modern, decisively directs our gaze away from the history of Truth to the unexpected: that we all, in the end, might be the heirs to a history of academic error – and even worse – that we unwittingly continue to ìlive in the academy by blunder. 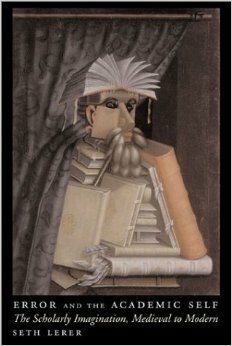 The academic and literary case histories that his Error and the Academic Self puts on display take the reader from the rhetoric of sublimity and salvation of Old English Studies, to George Eliot's Causaubon – the master of Victorian philology – all the way to a genealogy of American rhetorical philology, from John Quincy Adams and Basil Gildersleeve to Paul de Man, J. Hillis Miller and Patricia Parker. True to its title, Lerer's study moves deftly between scholarly investigation and imaginative creation, bearing in the process on philology, rhetoric, and fiction, politics and poetics, authorship and readership. Proceeding from the claim that the academy is riddled with blunders, Lerer's passionate study nonetheless mounts a supple and surefooted argument about the force of error, errata, and errancy in the production, in print, of knowledge. It does so by returning to philology, a field once central but now marginal to literary curricula, and by bringing together a diverse but coherent array of texts from Beowulf to Middlemarch to Mimesis, from errata sheets and proofs to the thesaurus and the Oxford English Dictionary. Eminently bookish, Lerer's study is also a learned meditation on the role of error and accuracy, mistakes and corrections, the wrong and the right in the fraught and fractured interplays between the Academy and real life. In the course of making its case, Lerer's engaging book manages to meditate on the affective dimensions of scholarly life, whether dedicated to sublime philology or ardent etymologies. For Lerer there can be no doubt that relationships among desire, discipline, pedagogy, and paternalism stand in the forefront of the profession of philology itself. Especially of note is Lerer's illuminating discussion of rhetorical philologists in nineteenth-century America, which is accompanied by a sustained reading of Eric Auerbach as European philologist in exile, who ended up sublimating his philological patrilineage into a vision of Lady Philology. In Lerer's hands, Auerbach's errancy, as he travels from Istanbul to Yale, via Penn State, becomes paradigmatic of the history of Comparative Literature in America. Fellow travelers in this history of error include René Wellek, whose story is itself really a narrative of the profession as a whole, and Paul de Man, whose work occupies a significant place in the longer history of rhetorical reading in America. Engaging till the very last, Lerer's book ends persuasively, that is, by convincing us that the long lineage of these distinguished philologists, scholars and theoreticians has helped to shape our own academic selves and – not to forget – our own occasional errors.